Test site recently re-located from S. Pedro de Moel to Viana do Castelo to accommodate both wave and wind technologies development (see “Process Status” section below). Initially located in near Marinha Grande, Leiria district, Portugal but recently re-located to Viana do Castelo in the north of the country. The Ocean Plug – Portuguese Pilot Zone was a governmental initiative which started in an inter-ministerial commission for maritime affairs regarding the definition of a National Ocean Strategy further established in the national law (Cabinet Resolution 163/2006 from 12th December). This area was created to attract demonstration and industrial development to Portugal, to develop an industrial cluster associated with wave power, to increase renewable energy production and to promote innovation supported by R&D. The Pilot Zone, renamed as Ocean Plug – Portuguese Pilot Zone, was designated in the national law in 2008 (Decree-law nº 5 /2008, 8th January) and a 320 km2 area was assigned in the central part of the country at a distance of about 5 to 8 km from the coast of Leiria. In 2008 it was also established (through Decree-law 238/2008 from 15th December) that the Ocean Plug would be granted by the public company REN (Redes Energéticas Nacionais, S. A.) who has further formed ENONDAS the company responsible for its management and operation. The concept behind the Ocean-Plug should allow the technology to evolve from the demonstration to the commercial scale saving time and money in licensing procedures. Preliminary environmental and geophysical studies legally required were concluded (http://www.oceanplug.pt/en-GB/local/). However, due to the progress of offshore wind technology and considering that the Ocean Plug concession area is only suitable for wave energy, there was a need to review the location of this pilot area. Also contributing to this review was the future installation of the WindFloat Atlantic project, the first 25 MW offshore wind floating farm, planned to be deployed in 2019 offshore Viana do Castelo. Following Governmental decisions from March (Resolution of the Council of Ministers no. 15/2016, of 9th March) and December 2016 (Resolution of the Council of Ministers no. 81-A/2016, of 9th December) the Pilot Zone for offshore wind and wave energy was decided to be settled in Viana do Castelo (Northern coast of Portugal). A 17 km electrical cable and an onshore electrical substation will allow other offshore energy technologies to be demonstrated and its use is to be managed by REN (the Portuguese TSO). This site is in depths between 85 and 100m. 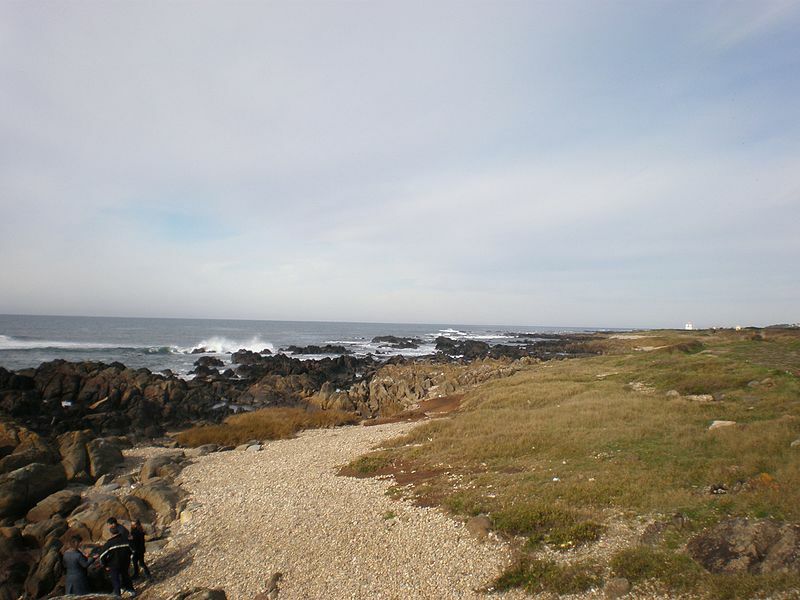 The access regulation to the Pilot Zone in S. Pedro de Moel has been provisionally approved by DGEG in 2014 and is available at the Ocean Plug website (http://www.oceanplug.pt/en-GB/biblioteca/). This regulation may need to be reviewed and adapted for the new area at Viana do Castelo. The information presented below has been collected for the S. Pedro de Moel area. No environmental information has been yet compiled for the new Ocean Plug area. The distribution in the area of the sea bird species Puffinus mauretanicus (Balearic shearwater) which is classified by the IUCN and Portuguese Red Lists as critically endangered (CR); and the distribution in the area of the species Calonectris diomedea (Cory’s shearwater) which is classified as vulnerable (VU) in the Portuguese Red List. There is a conditional compatibility of ocean energy projects with sea bird conservation purposes, although the potential for the enhancement in food availability due to fisheries reduction is considered a very positive impact harmonized with general conservation objectives. The preliminary analysis of the sediment quality showed a vestigial to slight contamination of the northern zone with Arsenic. Ocean Plug is located in Portugal. Hydrographic survey for bathymetry validation. The survey was conducted between 28th May and 25th June 2011 with multi beam sonar system following the S-44 “Standards for Hydrographic Surveys” (OHI). Spatial data files which will soon be available through the internet. Was made simultaneously High-power, low-frequency, wide-band Sub-Bottom Profiler (SBP). Wave climate (wave height, period, direction, power, temperature, pH). Series of data have been obtained and will be soon available through the internet. Analyses were made to evaluate the following parameters: temperature, pH, dissolved oxygen, salinity, suspended particulate matter, hardness, phaeopigments, chlorophyll (a, b and c), nutrients (NO3, NO2, NH4, PO4, SiO2), heavy metals (As, Cd, Cr, Cu, Fe, Hg, Ni, Pb, Zn), oil and grass (O&G) and PAHs. Analyses were made to evaluate the following parameters: pH, nutrients (NO3, NO2, NH4, PO4, SiO2), heavy metals (As, Cd, Cr, Cu, Fe, Hg, Ni, Pb, Zn), oil and grass (O&G) and PAHs. Nutrients: concentrations are not homogeneous along the area being higher in the northern area. Heavy metal contamination: concentrations are not homogenous through the area but are generally lower closer to the coast. There’s a vestigial / slight contamination with Arsenic. PAHs: No contamination with these compounds was detected. Large vertebrate (marine mammals and other) observations for baseline characterization. Visual observations in parallel transepts distancing about 800m from each other, covering all site area; daily observations of about 12h. The campaign run from 30th May to 20th June 2011. Cetaceans: only common dolphin (Delphinus delphis) has been observed in the study area during the campaign period. Dolphins have been observed in groups of five or less individuals. Other large vertebrates: occasional observations of marine turtles (Caretta caretta) have been registered. Sea birds visual observations for baseline characterization. Visual observations in parallel transepts distancing about 800m from each other, covering all site area; daily observations of about 12h. The campaign run from 30th May to 20th June 2011and following standard European methodologies and criteria for the study of sea birds. 15 different sea bird species have been observed. The most frequent and abundant in the area were: Balearic Shearwater (Puffinus mauretanicus), Gannet (Morus bassana), Cory’s Shearwater (Calonectris diomedea) and Yellow-legged Gull (Larus michahellis). All together these species represented about 96% of the sea birds observed in the study area. No specific distribution patterns have been observed for these species. However the Yellow-legged Gull, the most abundant species has been observed predominantly in the NW zone of the study area; and the Balearic Shearwater has a regular presence in the closest transepts to the coast. The ocean plug reports are currently available through the SOWFIA data management platform but will be also available through the test site website. No environmental research projects are currently planned for the site.